The Jiangsu Tianrong Group is an advanced company in the agricultural sector. The area that has been chosen as location for the company lays outside the city of Nanjing and is transforming from an industrial site to a service related area. 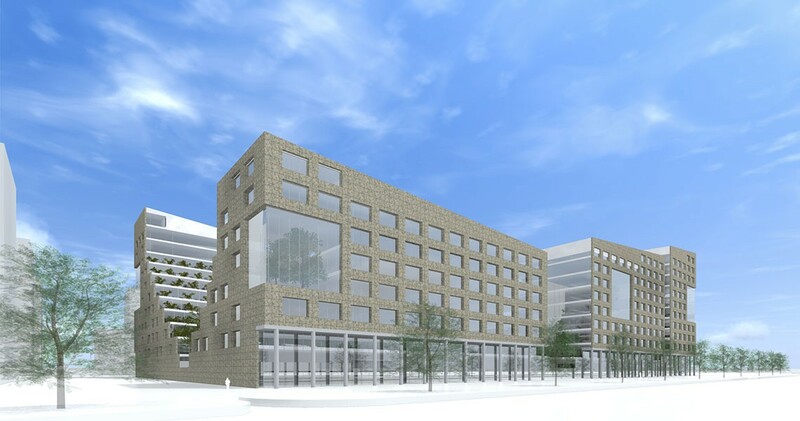 AULa has devised a plan design with expressive architecture and a functional layout. At the same time the plan reaches out to the future, because it is a step towards a city pattern. 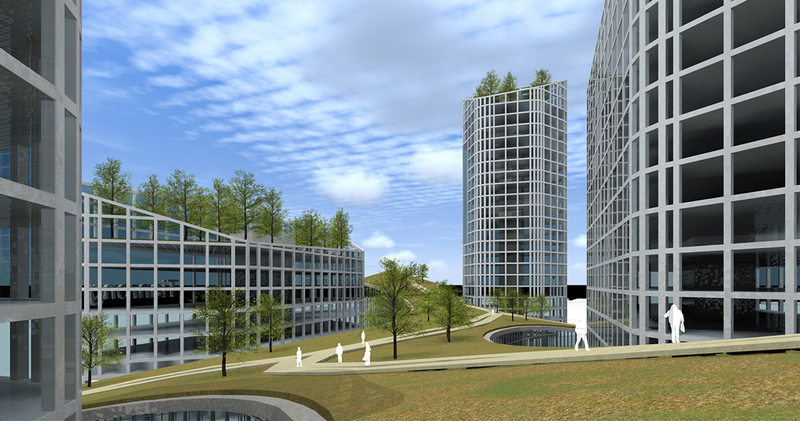 In the models the area is not just an open field with separate buildings, but a composition of landscape and urban space. All buildings have an open and inviting character for the streets around. The entrances of the towers on the edges of the area are transparant and representative for the companies that are active there. The building in the middle serves as a place for expositions, conferences, restaurants and other services. All the buildings have a green roof. The roofs are accessible for the people who work in the area. There are public as well as intimate spaces in the plan. If you follow the façades of the buildings you’ll find a more intimate street in the curved spaces, while there are main streets on the other side of the façade. This building block is carved out at the inside to form a valley. The street side of the buildings is very open. You can walk under the arcades along the inviting glass façades of each building. Here you can enter different facilities such as restaurants, cafes and other services. This forms a lively scene. 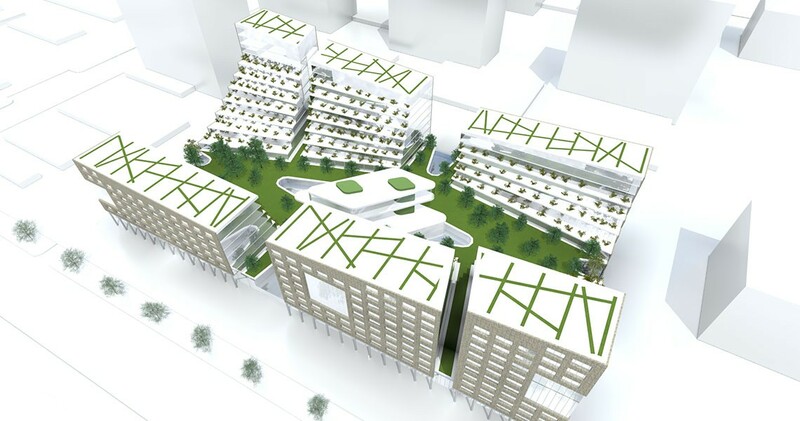 At the inward side the buildings step out with green terraces towards a green deck. Here are the entrances for the offices. The two-level parking garage is situated in the middle of the deck. The green deck is accessible from different sides so everyone can visit. 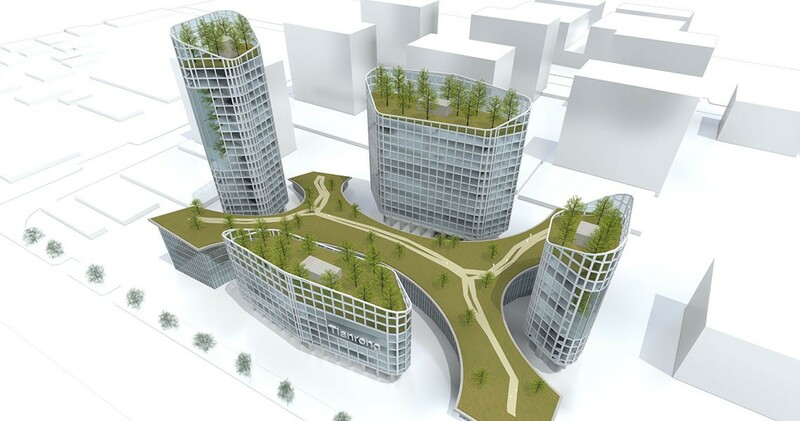 In this design, the area looks and functions like a small city. 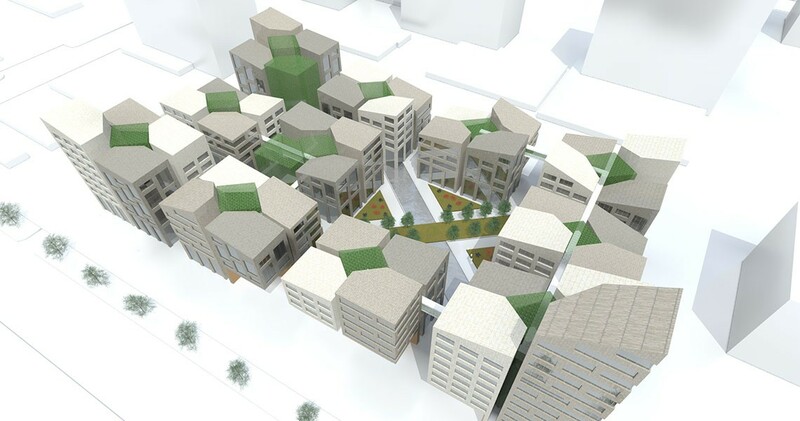 The plan consists out of different building blocks that are connected through streets and squares. There will be limited car traffic and it will mainly be an urban pedestrian area. The square in the middle of the east side is the public place around which facilities are gathered. 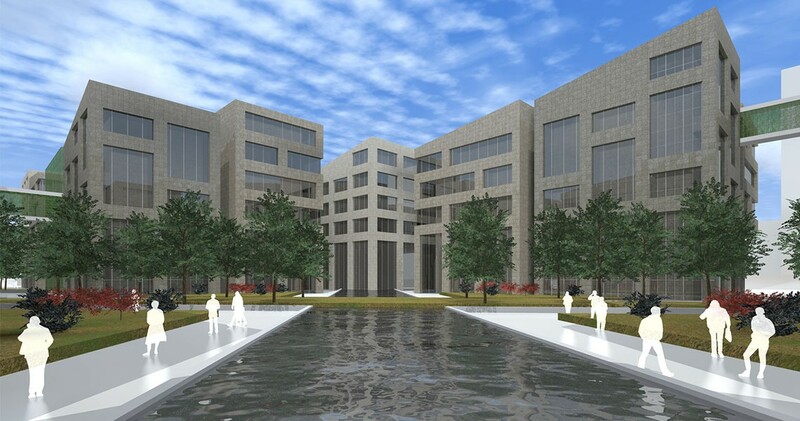 Each block contains four different buildings with in the middle a courtyard. Companies can compose a floorplan and a volume according to their needs. It is even possible to use a complete building or make a combination of more buildings connected by bridges. This way companies of diverse scale can settle here.